This is a scenic road loop without any serious climbs; at least when done clockwise, as represented here. As implied by the name of the road from which the ride gets its name, the marine scenery is one of the big draws for this ride, although the parts of the ride not exposed to the sea are quite pretty as well, as the route snakes through rolling, low, coastal hills (especially with the green grass of late winter or early spring). The ride passes through three towns: Martinez, Crockett, and Port Costa. Any of these would be a reasonable place from which to start the loop. However, if you'll be driving here to do the ride, reaching Port Costa will take you a little longer than reaching Crockett or Martinez. Additionally, street-parking options might be more generous in Martinez, due to its bigger street network. For these reasons, I have opted for Martinez as my starting point on this ride. You'll notice that the suggested parking spot linked on this page points to a residential street (Raap Avenue). This was the best option I could find without getting too far off the route of the ride. You'll notice that one side of the street at the suggested spot corresponds to the backs of a couple of businesses. If you park on that business side of this side street, it might be more considerate in terms of not directly taking up any parking space that the residents of this street or their guests might need to use. Starting the loop in Martinez and doing it clockwise will mean that you'll complete the inland half of the loop first. Franklin Canyon Road, which constitutes most of this part of the ride is a quiet country road initially lined by homes with verdant gardens and some with horse stables. This gives way to wide open and less shady grazing lands, as the road starts paralleling Route 4 more closely. Cummings Skyway, on which you complete the inland portion of the loop is less quaint. It's flanked by exposed grassy hills and few signs of civilization. As you crest the climb on this part of the ride, you start a nice, curvy, and fast descent toward the small town of Crockett. Crockett doesn't exactly have a vibrant sidewalk cafe scene or anything, but if you need any food, drink, or basic supplies, you'll find a few stores (and eateries) here where you can obtain those. There are even a couple of art galleries that I noticed there, but I wouldn't say that those are enough to make this a window-shopping destination. You'll find yourself on the Carquinez Scenic Drive as soon as you leave the last home in Crockett behind. 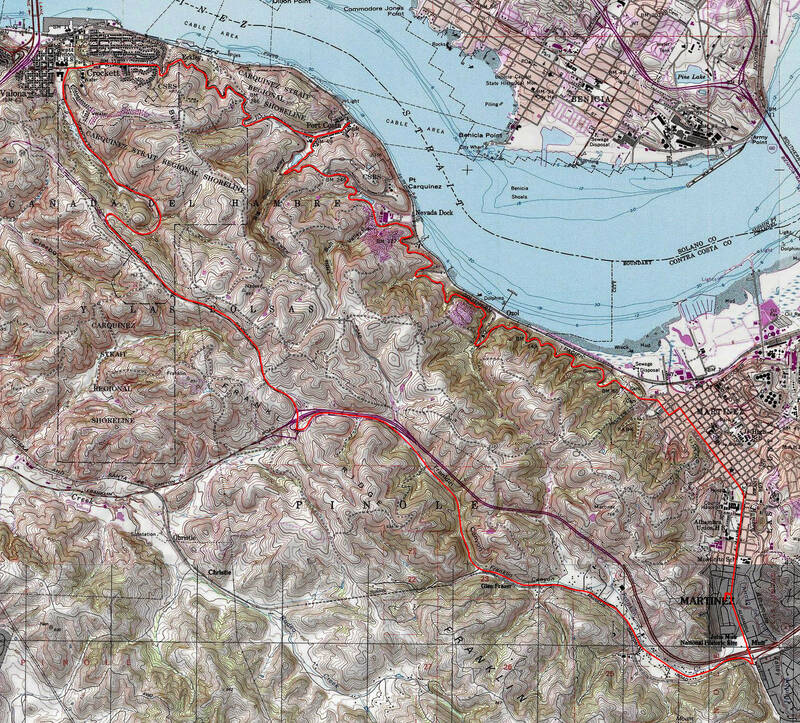 This road follows flatly on average along the coast of the Carquinez Strait as it weaves in and out of every fold of the coastal hills, though there is no shortage of brief climbs and descents of moderate slope during all that meandering. The stop that the route on this page makes at Port Costa is an entirely optional diversion, of course. However, it's one of the more interesting highlights of the ride. This tiny town that history forgot lives on mainly as a meeting spot for motorcycle riders and other weekend explorers. There is a funky restaurant and a pub, either of which would be a good excuse for a rest stop, as well as a curio shop or two. Shortly after the Port Costa visit, you arrive at a gate where the old course of Carquinez Scenic Drive continues on in the form of the paved George Miller Trail. This nearly two-mile trail makes up some of the portions of the old course of the road that were closest to the coast. Consequently, this part of the route presents some of the best water views available on this ride. The trail is quite popular among joggers and casual walkers as well as cyclists. So, don't expect to have it all to yourself. And, since its construction is relatively recent, its pavement quality is top-notch and the surface is flawless (at least as of the time of my most recent ride in late 2016). George Miller Trail ultimately ends at another gate after which the road is open to traffic again and returns to being called "Carquinez Scenic Drive". With little change in scenery, this portion of Carquinez Scenic Drive will take you all the way to the outer neighborhoods of Martinez, after which you follow city streets to return to your starting point. The overall ride route is quite safe for bikers. You ride with some boulevard traffic through Martinez, but that's one of the stretches of the ride that features a good bike lane. Only part of Franklin Canyon Road features a formally marked bike lane, but even the parts of that road that don't have one are quite wide and have very little traffic. Carquinez Scenic Drive itself is the only narrow road segment on this route without a bike lane or a good amount of shoulder space. The portion of this road that's between Crockett and Port Costa sees a moderate amount of traffic. A surprising amount, in fact, but that's probably only on weekends. The rest of the ride all the way to Martinez is effectively deserted. As I mentioned already, doing the ride clockwise is the easier option in terms of the climbs that are involved. What climbs there are until you reach the highest elevation point of the ride (just before the descent toward Crockett begins) hardly ever exceed 3% grade, with the exception of one spot where the grade momentarily touches 9 or 10 percent just before the intersection with Cummings Skyway. Meanwhile, none of the minor up-and-down undulations along Carquinez Scenic Drive are worth any calculation. If done counter-clockwise, the descent toward Crockett becomes a climb for just over two miles where the grade rarely exceeds 8% or so. As long as you're okay with that, one might even argue that it's a bit preferable to do the ride counter-clockwise, because that would put you on the seaward side of the road on Carquinez Scenic Drive, affording you marginally better views (though you can ride on that side along the closed segment of the road regardless of loop direction, obviously). The ride route does provide some amount of tree cover. The initial stretches of Franklin Canyon Road on this road and much of Carquinez Scenic Drive are shaded. Not much of this is unbroken shade, but it might still be enough to spell the difference between unbearableness and just enough relief, if you happen to do this ride during the warm part of the year. Last but not least, another major point of interest along this route is the John Muir National Historic Site. This is the last home of the prominent naturalist John Muir, where he spent the last couple of decades of his life. The home is right on Alhambra Avenue, and this route passes by it only a few blocks after the start of the ride. Visiting it would make a good post-ride diversion for anyone describing themselves as nature lovers. Referred to as "the father of the national park system", it's difficult to overstate the importance of Muir's work, though he probably doesn't need too much introduction for most viewers of this page. Your options for extending this route into a longer road ride are wide open. Essentially, any country roads you can explore south of Route 4 are likely to make for a fun ride in the spring. Alhambra Valley Road would appear to be one such obvious option. You can also extend your road ride to include a full lap of the Three Bears Loop around the San Pablo and Briones reservoirs. There are also a few possibilities for adding some trail time to your ride. The great singletrack in Crockett Hills Regional Park directly connects to this route. Beyond that, while I haven't tried these myself, you can replace the last portion of Carquinez Scenic Drive traversed on this ride with a trail ride through Carquinez Strait Regional Shoreline by following Franklin Ridge Loop Trail to Hulet Hornbeck Trail (which are also labeled collectively as "California Riding and Hiking Trail" on the park's trail map), or you can continue further south on Alhambra Avenue from Martinez to take the entrance into Briones Regional Park off Alhambra Valley Road and knock yourself out exploring the miles and miles of fire roads in that park. Meanwhile, this trail map seems to indicate that you should be able to follow the California Riding and Hiking Trail straight from the same intersection at which you turn onto Franklin Canyon Drive on this particular ride, and follow that trail to the (paved) Contra Costa Canal Trail, which, in turn, takes you to the (paved) Iron Horse Regional Trail, which you can then follow for miles and miles down San Ramon Valley, and run out of daylight before you run out of trails to ride.